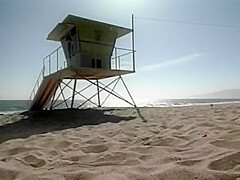 Description: With a brand new staff of lifeguards, the beach is the hottest place in town for action of all kinds! New boss Kelly Jaye whips troublemaker April, athletic Holly Body, and new lifeguard Mickey Ray into shape. Then Stephanie Swift and Farrah heat up the hearts and hard-ons of all the muscle heads who hang out on the beach. This summer these girls are scorching anything within five feet of them!